Small and quick sewing projects are wonderful for crafters who have a little bit of time and a lot of fabric scraps in their stash. Create a classy catch-all for keys, coins or any small items that need to be corralled by making a fabric bowl. Make fabric bowls as an inexpensive activity for women's groups, scouts or after-school programs. They are convenient last-minute gifts and can be made to match anyone's decor style. Cut a 10-inch square from the outer fabric, inner fabric and the felt. Cut two, 10-inch squares from the lightweight fusible web. Lay the outer fabric wrong side up on your ironing surface. Place one fusible web square, glue side down (paper side up), on the outer fabric. Match the edges and iron to adhere. Repeat with the inner fabric circle. Peel the paper from the attached fusible web. Place one fabric square wrong side up on your ironing surface. Lay the felt on the square, matching the edges. Place the remaining fabric square, wrong side down on the felt. Iron to adhere the squares together. Draw a 9-inch circle on newspaper, using a compass. Cut out the circle. This is the pattern for the base of the bowl. Pin the circle to the sandwiched fabric and cut out. Remove the pattern. Fold the paper circle in half and crease the fold. Fold in half twice more, creasing the folds. Unfold the paper. You will have eight creased lines that create eight pie sections on the circle. Lay the fabric circle on your work surface with the inner fabric facing up. Place the paper circle on the fabric circle. Use a disappearing ink pen to mark the edge of the fabric circle at the point of each of the eight creased lines. Remove the paper. Use a ruler as a straight edge to attach opposing marks across the circle. Draw a line along the ruler. Repeat until you have eight pie sections drawn on the fabric. Draw a 3-inch circle in the center of the paper circle, using a compass. Cut out the 3-inch circle. You now have a donut shaped paper pattern. Place the pattern on the fabric. Trace the inner circle, using a disappearing ink pen. Create triangles on the outer edge of the fabric circle, on each of the eight pie section lines. Mark a 1/2-inch on each side of one line, on the edge of the fabric circle. This will create a 1-inch base to your triangle. Measure 2-inches up the line and mark. This is the top point of your triangle. Use a ruler and pen to connect the points, creating a triangle. Repeat on all the traced lines. Cut out the triangles. The fabric circle will resemble a flower with wedge petals. 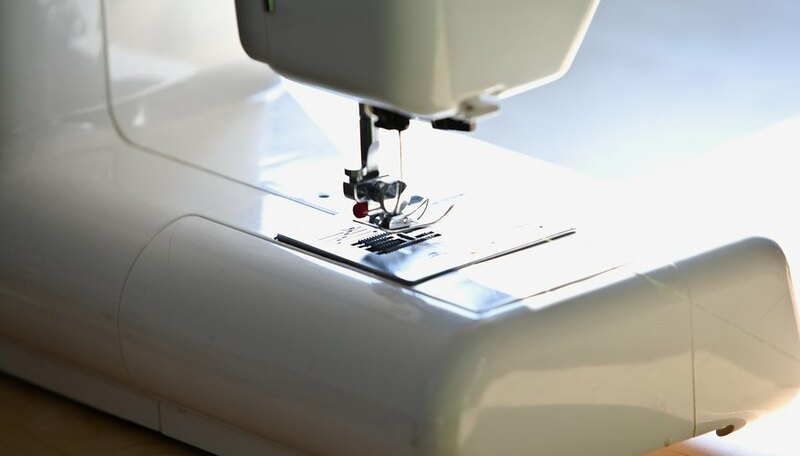 Adjust your sewing machine by tightening your zig-zag stitch to a satin stitch. Satin stitch around the line of the 3-inch inner circle. Starting at the edge of the inner circle, lower the presser foot over a pie section line. Satin stitch on the line to the top point of the triangle. Bring the side edges of the triangle together and continue to satin stitch them together to the edge of the outer circle. This creates the curve of the fabric bowl. Repeat with each pie section line and triangle. Satin stitch around the outer edge of the fabric bowl to finish. Remove your pen marks according to the manufacturer's directions for your pen.